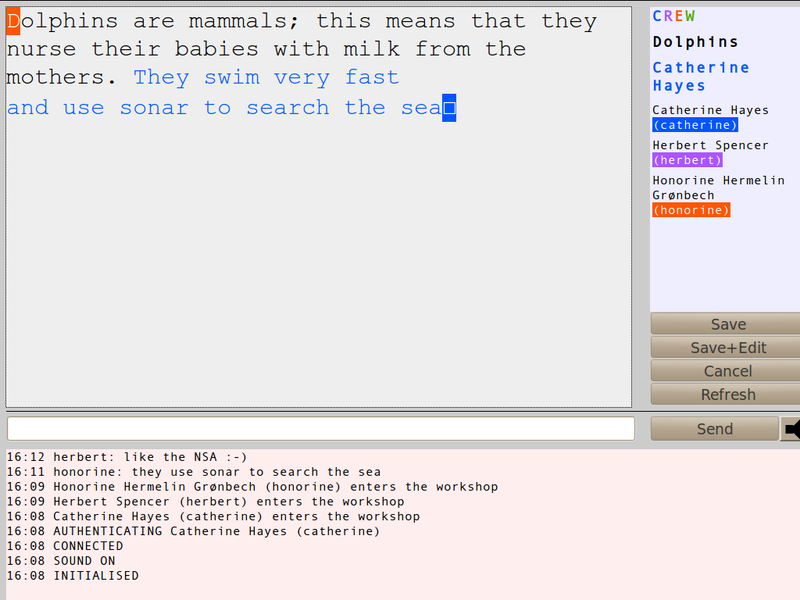 CREW (Collaborative Remote Educational Workshop) is a browser-based, real-time collaborative editor (RTCE), allowing several people to simultaneously edit the same text file. This chapter elaborates on other chapters. We assume you have at least done the Basic procedures for beginners of the Website@School Users' Guide. For pupils and teachers working with CREW is easy. However, setting up CREW is not a piece of cake. If you are unfamiliar with securely opening one, and only one! port on the schools firewall, feel unconfortable when installing software on a production server and configuring files, please seek help at your local Linux User Group (LUG). They are virtually everywhere and are most willing to perform a small service for the school that (probably) teaches their children. Collaborate in the school's own cloud (when the CREW server is installed on the school server). CREW page access permissions can be changed by members of the workgroup, i.e. non-webmasters. This feature enables the group to publish pages. 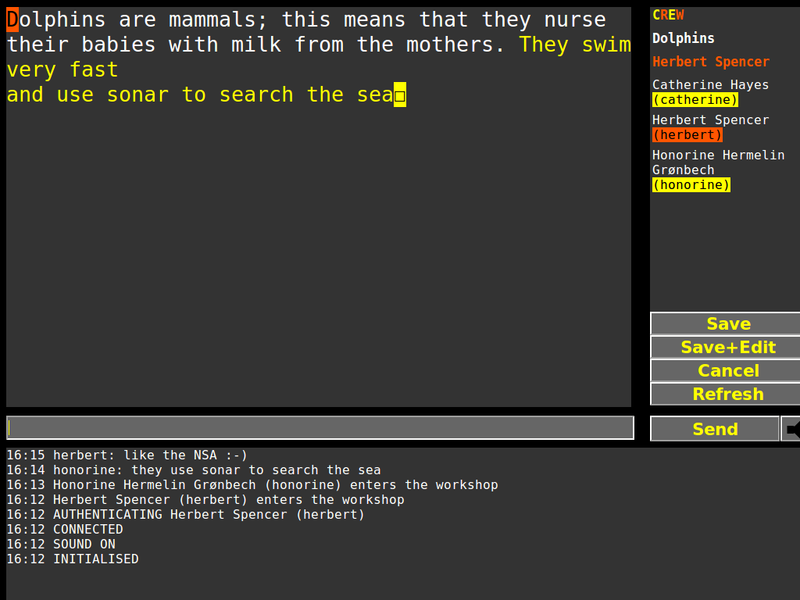 Each user has their own text color and cursor. Skins to accomodate visually impaired users. Created texts can be cut and paste from the page. Other tools on the Internet can be used to convert the content. In this way it is, for example, possible to collaborate in LaTeX. Password security on server and client. Maximum number of workshops: in the configuration file set at 7; maximum: 32. Maximum number of users per workshop: in the configuration file set at 3; maximum: 26. Built-in chat with on/off audio signal when messages arrive. Chat messages cannot be saved. Full UTF-8. BMP (please see 1.4 Backgrounds below) is supported. CREW opens in a new window. This requires enabling popup windows in the browser. The way CREW opeates, somtimes causes a short lag. CREW sends its data unencrypted over the Internet. In the next version we will use encryption. CREW is designeed to operate with the Firefox browser, which is available for Linux, Mac and Winodows. Firefox uses OS (Open Standards) and is OSS (Open Source Software), complying to W3C standards, which cannot be said for Window's' Internet Explorer and Mac's Safari. Preferably use the latest version. For a list of versions that support the websocket protocol, please see http://caniuse.com/websockets. CREW skins are created with 4.2.2. Bazaar Style Style, our own (2011) implementation of CSS Cascading Style Sheets, (1996) a language used for describing the look and formatting of a document written in a markup language. It is designed primarily to enable the separation of document content from document presentation. This separation can improve content accessibility. The Basic Multilanguage Plane (BMP) contains characters for almost all modern languages, and a large number of special characters. A primary objective for the BMP is to support the unification of prior character sets as well as characters for writing. Most of the allocated code points in the BMP are used to encode Chinese, Japanese, and Korean (CJK) characters. last but not least, to be able to read with certain privileges and to edit you must have an account. Adding a page supposes that you have sufficient permissions to add a page. This is specially important for non-webmasters like pupils and teachers who often have limited permissions. These permissions are set in the Account Manager, most times by the webmaster Wilhelmina Bladergroen. In the Module dropdown menu, select the module. Do not forget to select Visible, Hidden or Embargo. Click [Save] to save your work and return to the Page Manager. Now click on the Page Name to enter the Module Name (modulename) configuration dialogue. In the next paragraph the module will be configured. in the Menu the link Content is selected. to create a blue font color. about dolphins. Maybe you know more about them. Later on we will hear more about Honorine Hermelin Grønbech (username honorine), the dolphins expert. Here, with the options, World and Authenticated, only the visibility, i.e the read permissions for the viewers of this page can be set. World: On a public Area, any visitor can view this page. On a Private Area (Intranet) those visitors who can login can view this page. Authenticated: Anyone who can login on the site can view this page. On a Private Area (Intranet) anyone who can login and has read permission can read this page. Individuals: Only when this option is selected, the options for the users and their permissions are applicable. For the GURU, all accounts in the EPS school (i.e. the demonstration data) are displayed and permissions can be set. Wilhelmina appears in the list twice. Once as normal user, having selectable permissions and once as Guru (greyed out because of her role as webmaster, thus Guru, thus by default always having all permissions). --: This user has no permissions at all, cannot read, cannot edit. Read: This user has read permission and can read this page. Read and edit: This user has read and write permissions. This means that she has access to selecting a skin and she has an  button to enter the CREW editor, edit texts and chat. Guru: In this module this option is not used. Greyed out user and dropdown menu with 'Guru': This user is the webmaster account, i.e. the person that installed Website@School, i.e. Guru, i.e. Wilhelmina Bladergroen. She is Guru by default, can read everything, which cannot be changed. This is normal. Save: After saving your work, you return to the Page Manager opening screen. The page is added. Herbert belongs to the group Juniors which consists of pupil Georgina and teacher Helen. Herbert can change these permissions. 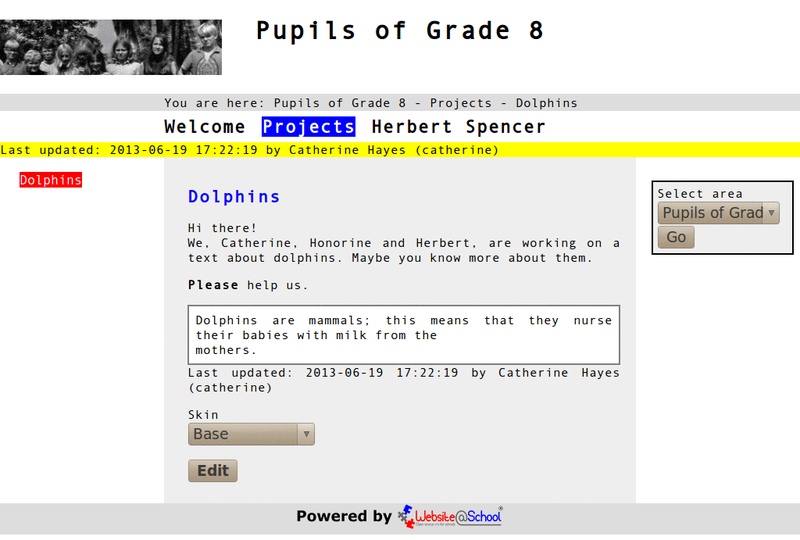 However, he does not belong to the group Seniors, so he can neither change the permissions of Catherine Hayes or any other member of that group, nor can he change the permissions of Honorine, the dolphins expert, who just received an account to visit the website and get access to the dolphins page via MyPage on the site. Honorine did not receive any permissions in her Admin and Page Manager. For details of the EPS groups, please see 1.3 The Exemplum Primary School in the Account Manager. In this paragraph we show you the results of the possible settings in the CREW configuration page. 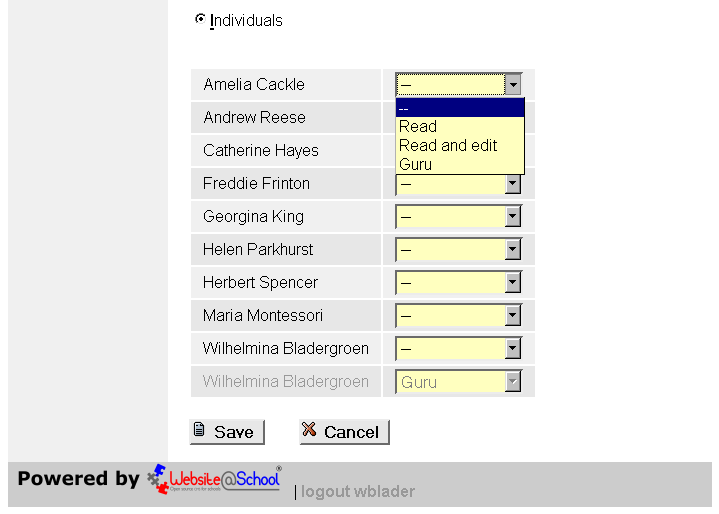 Individuals selected, Catherine, Herbert and Honorine have Read and edit permissions, all other EPS users have none. CREW page on the Area of Grade 8. No header, no introduction, no text, just: Sorry, you currently have no permissions to view this page. her permissions were accidentally left on -- (none) in the CREW configuration page. Same page. The header, introduction and text are visible. an anonymous visitor AFTER the visibility is set to World. Yellow status message: Last updated: yyyy-mm-dd hh:mm:ss by Firstname Lastname (username), header, introduction, text, Last updated: yyyy-mm-dd hh:mm:ss by Firstname Lastname (username), Skins dropdown menu (default: Base), [Edit] button. Catherine, Honorine and Herbert, i.e. the users that have Read and edit permissions on the page, set in the Workshop (CREW) configuration. Even when the visibility is set to World or Authenticated, the Skin and [Edit] button are not available. This is a security feature, preventing anonymous or unauthenticated users to enter the CREW page. Text pane: Most of the screen space is used to create or modify text. Each user has her/his own cursor and text color. Occasionally, when typing text, there is a short lag, for example, , disappearing within a second or so. hh:mm ERROR: document is too large (67568 characters), maximum is 65536. Nothing is saved but the already written text is retained and the user remains in the CREW editor. CREW: The name of the editor. A mouseover shows the unabridged name of the editor, its version number and date. Workshop name: The header text is used. A mouseover shows the full URL path to the page. Full user name: The name of the user. The color of the name indicates the cursor color for this user. A mouseover shows this user's IP address, port number and color=A. color=A is the color of the first user. The maximum number of users is 26 (a-z), each with their own color. Full user name + login name: The (small) user name is not colored, the user name has the cursor color as background to emphasize it. The list of users can be longer. Default in the configuration file is 3. A mouseover shows the full user name, the user name and color A. Save: To save your work and return to the page with header, description and saved text. A mouseover gives a short explanation of the buttons function. Save+Edit: When saving, you stay in the CREW workshop. Because all your modifications, and those of others, travle over the Internet, it is a good idea to often save your work. A mouseover gives a short explanation of the buttons function. Cancel: Your last changes are not saved. You return to the page with the header and introduction. A mouseover gives a short explanation of the buttons function. Refresh: Retrieve a fresh work copy of the document that is currently edited by all the page users. A mouseover gives a short explanation of the buttons function. Chat pane: The chat can be used to send messages about the text, thus keeping the text clean. Chat text entry field: Type your text here and hit the [Enter] key on your keyboard to send text to all participants. Send: Sends your message to all participants. It is much easier to hit the [Enter] key on your keyboard. A mouseover gives a short explanation of the buttons function. Speaker icon: On/off toggle for the beep. If off, a red cross is visible in the speaker icon. A mouseover gives a short explanation of the buttons function. Messages field: Chat messages cannot be saved. This is a feature. The window of the chat messages is 120, whereafter the oldest disappears as the newest is added. The 120 messages can of course be saved with cut and paste. Chat messages sent by you and the other users of this page. System status and error messages. Try the Mondriaan skin, named after the famous Dutch painter Piet Mondriaan (Amersfoort, 7 maart 1872 - New York, 1 februari 1944) yourself. We created CREW to be used with the Firefox browser. Reason: CREW then functions on Linux, Mac, FreeBSD, HPUX, Windows and many others. To enable popup windows, click on the Preferences button and select: Allow popups for (for example) exemplum.eu. To enable popup windows permanently, go: Menu > Edit > Preferences > Content: uncheck 'Block popup windows'. Browser support: Does your version of Firefox support the websocket protocol? Check your current version by, in the menu selecting Help > About Firefox to find out the version number. Next, check the list on the Can I use Websockets? page. CREW does not work with Windows Internet Explorer (IE is not standards compliant (as usual)), on Mac's Safari (it seems unable to open specific ports, even Mac users complain), Chrome (unknown causes, please tell us). Check if the CREW server is actually running. Go to the website where the server is located and enter URL; if the port number is not 80, the port number in the browser, for example http://exemple.eu:8008 or http://anotherserver.org. When you receive the message '404 Bad request', the CREW server is functioning because this message is generated by the CREW server. The advanced options also apply to this module. In particular it means that you can use Bazaar Style Style (BSS) to get rid of aweful colors that mismatch with the school site or with the pictures on the page. More about the background of BSS can be found in chapter Viewpoints, paragraph 4. On form and content. The webmaster Wilhelmina Bladergroen, has to do a simple task before anyone can do anything with CREW: configure the CREW module. Do not worry, the values below are given to you by the systems administrator, the person who installed the CREW server. Origin: For example http://exemplum.eu. This parameter MUST match the location of the website as seen in the browser of a website visitor. If Website@School is not installed in the servers document root or operates on a port differing from port 80 but, for examples in: http://exampleschool.org/was or http://exampleschool.org:8008 or http://exampleschool.org:8008/was. In those cases http://exampleschool.org or http://exempleschool:8008 must be entered in this field. Location: For example ws://exemplum.eu:8008. This URL MUST point to the CREW Websocket server you are using for this module. This could be the school server, using another port than port 80, for example a non-standard port 8008 ws://www.yourserver.org:8008 or another server at standard port 80, as example ws://www.anotherserver.org. This entry MUST match the secret code in the CREW Websocket server the school is using. If this server is not under your control you have to ask the owner of the server to obtain a valid secret code. The secret key is visible in plain text, not masked with asterisks. This feature enables you to check and coordinate this code with the systems administrator. Save: After saving your work, you return to the Module Manager opening screen. Most times you will have received these parameters from a systems administrator. Before handing over CREW to users who trust their valuable collaborative efforts to their browsers, it's a sensible idea to test CREW. This test must be done on two workstations, each with their own browser. 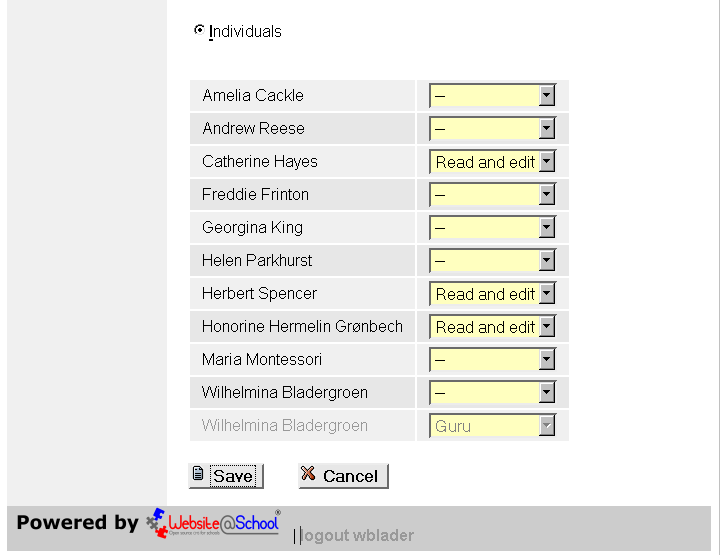 One for the webmaster Wilhelmina Bladergroen (username: wblader) and one for user Herbert Spencer (username: herbert). Reason for two PC's: you cannot be logged in and, at the same time on the same browser, be logged out. This is a feature of the browser. The workstation for the webmaster can be an old one, with an old browser that does not support CREW. As wblader, login on the old workstation. 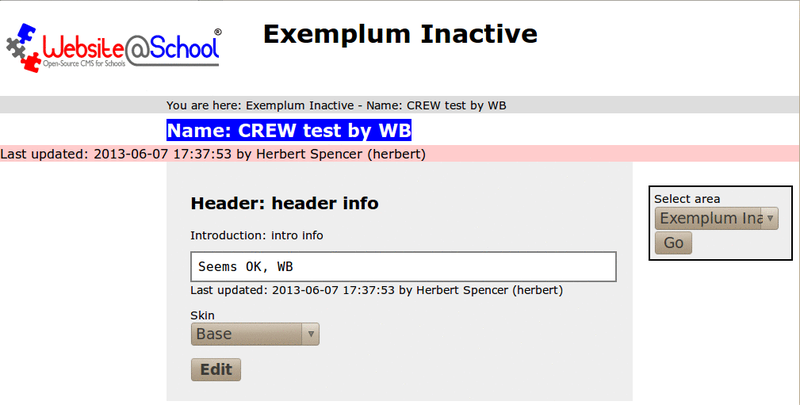 Use the 'Exemplum Inactive' Area to create a new CREW page. Make the Area active so it can be seen by anyone. In the CREW page content, set 'Visibility' on 'Individual'. Do not give anyone any permissions (--) on the CREW page. In the Page Manager, in the Area 'Exemplum Inactive', grant Herbert permissions to manage the page, for example Sectionmaster. Notice that only the page name is visible for the anonymous visitor. In the CREW page content, set the visibility of the page to 'Authenticated'. Go to the site and refresh the page (F5) and check that the anonymous visitor still has no information, just the page name. 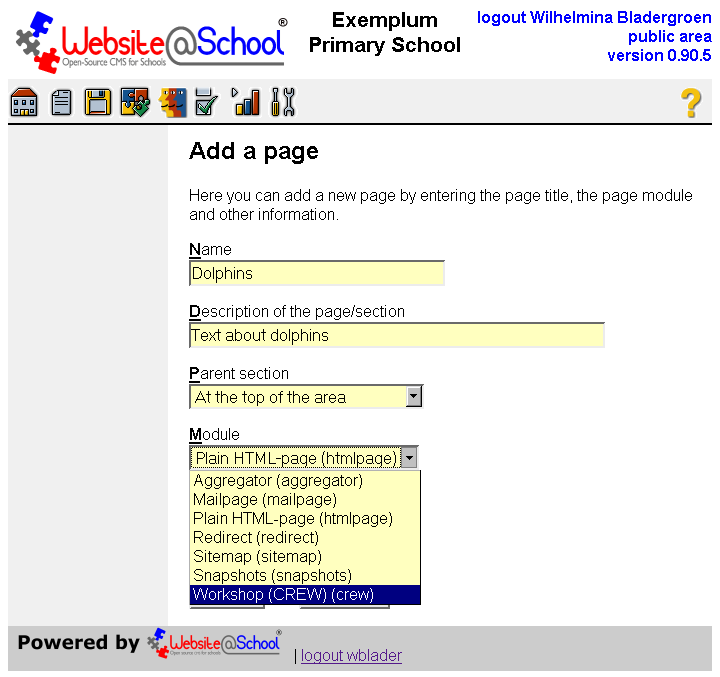 Use the Area selector, got to the Exemplum Primary School Area, use the MyPage link to log in. Then switch to 'Exemplum Inactive'. In the URL bar, type as example http://exemplum.eu/index.php?login=1. You are on the log in screen and can log in. 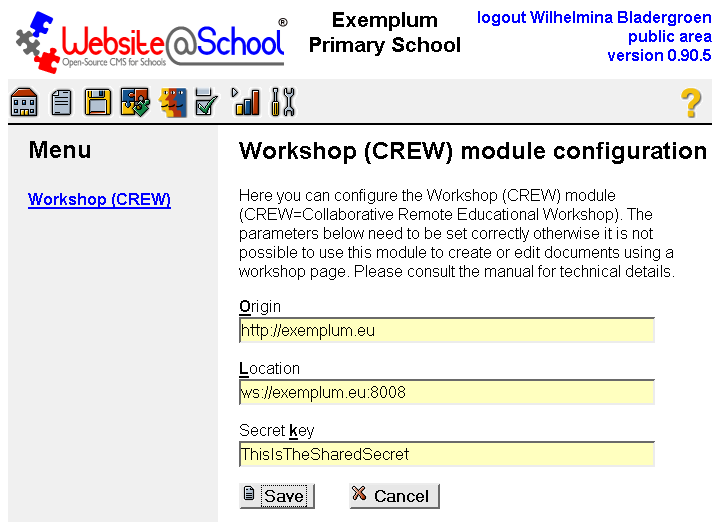 Do not login via http://exemplum.eu/admin.php which gives access to Website@School management. Herbert can see some information, i.e. the header and the introduction. There is no text in the rectangle because Wilhelmina hasn't put any text in there. Notice: there is no dropdown menu for the skins and no [Edit] button. Now in the Workshop (CREW) configuration, grant Herbert 'Read and edit' permissions. Save your work. 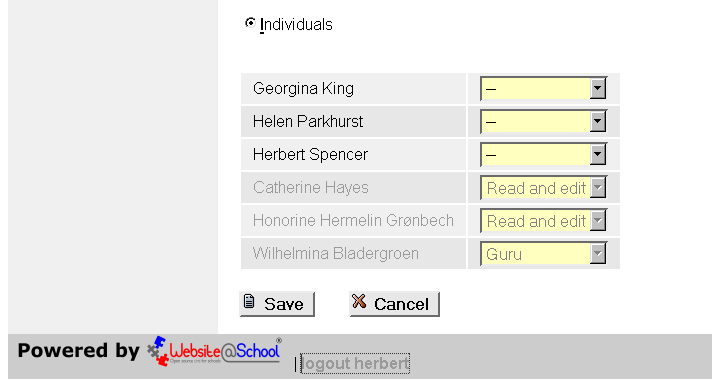 Herbert now has permissions to edit the page and can also see when and by whom the page was changed the last time. 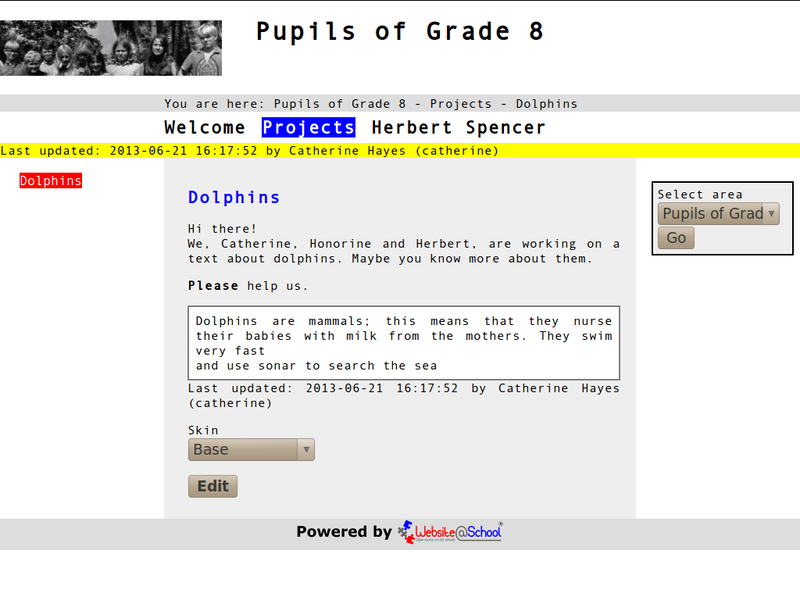 Now either she or Herbert can create a CREW page for the Dolphins project. Wilhelmina doesn't forget to set the test area to inactive. For the schools systems administrator, having root access to 'his' server, the installation of the CREW websocket server is quite straightforward; please go directly to paragraph 4.3 Server installation. To facilitate schools using ServerAtSchool we provide extra information about servers and ports, their firewall and an init script; please read on. Before the installation can take place, there are a few questions to answer. When installing on the school server, port 80 is already occupied by the existing Apache webserver, serving Website@SChool. Thus the CREW server must make use of another free and unassigned port. Default configuration for the CREW websocket server is port 8008. The firewall must be opened for this port. See paragraph 4.2 Firewalls below. Some website visitor have modems that are configured to block traffic on certain ports. Experience indicated that these users cannot make use of Workshop CREW on port 8008. If you want to avoid this problem, you have to use the next option. Run the CREW server on another server on port 80. Perhaps the school has more IP adresses and can setup another server, or maybe the Board's office has extra IP adresses to facilitate all the schools under their jurisdiction. A second IP address on the same server, serving port 80. You are an experienced Linux Guru and perfectly know how to do this. Unexperienced users, Google and search for ifcfg multiple ip address and go to your local Linux User Group (LUG). They are virtually everywhere and are most willing to perform a small service for the school that (probably) teaches their children. There may be other solutions. Please tell us. There are hundreds types of firewalls, so it's impossible to give a prescription. In general, when using the CREW server on port 8008, the firewall must allow inbound TCP traffic from all unprivileged ports for new and established connection to initiate a connection to port 8008. And the firewall must enable outbound traffic, i.e. answers from your server on port 8008, just for established connections. ServerAtSchool uses the GIPTables firewall. From the blurb: "GIPTables Firewall is a free set of shell scripts that helps you generate iptables rules for Linux 2.4.x and newer kernels. It is very easy to configure and at present, designed to run on hosts with one or two network cards. It doesn't require you to install any additional components to make it work with your GNU/Linux system. All you need to set-up a very secure firewall for your GNU/Linux machines its iptables and GIPTables Firewall." # ---- THE END OF THE FIREWALL ----, save and restart the firewall with service giptables restart. Now the other three rules can be interpreted in the same way. [*] Privileged ports (0-1023) are for certain services and can only be used by root. Unprivileged ports (1024-65534) can be used by any user. With its 47 chapters and 1200+ pages this book is the ultimate reference documentation for OpenNA Linux. In a simple and structured way the book explains the ways a server can be configured in a safe way. A lot of popular Linux-based services are discussed in extenso. Nowadayas the book can be downloaded in PDF format from: http://www.openna.com/pdfs/Securing-Optimizing-Linux-The-Hacking-Solution-v3.0.pdf. Highly recommended. NOTICE: There might be a pitfall. When the server is behind a router, the schools IP address and the IP address of eth0 can differ. In that case, traffic from the outside world to the router must be forwarded to the servers IP address with port forwarding in the router. We assume the websockets server is properly working, and some user in the world has already successfully used the CREW page, for example Wilhelmina Bladergroen from her home address. Start the browser and surf to, for example: http://exemplum.eu. The school page must be visible. Then add the port, i.e. http://exemplum.eu:8008. When you don't receive the message '404 Bad request' (a CREW server message), you have a problem on your side, probably the browser or the modem refuses traffic on port 8008. Websockets really working on your browser: simple browser test on: http://www.websocket.org/echo.html. Result: probably OK because the simple browser test only uses port 80. Below is the readme.txt, copied from the crewserver.zip. 2. Find a quiet place to unzip this file, perhaps your $HOME directory. CMS Root Folder (where admin.php and index.php live). can use the example-configuration file as guidance and/or documentation. You can now run the server as follows. 0400 or 0640 or 0644 if you want. permissions are as minimal as possible (preferably 0400). checking the entries in the system logfiles, e.g. /var/log/messages. the messages will be written on your screen. PHP-interpreter on the first line of crewserver.php (see below). follow the tail of the logfile, e.g. tail -f /var/log/message. machine, you need to adjust the first line in crewserver.php accordingly. the server can be used. made available to the outside world via this mechanism. Please refer to the manual that documents CREW for more information. # ORIGIN = http://exemplum.eu, ThisIsTheSharedSecret, 3, 7. # See below for more information per item. # The format of this file is as follows. #   by the user's browser. It is used as part of the authentication of users. #   of your webserver as it is seen by the user's browser. #   substitute the hexadecimal value ('%20' for space, '%2C' for a comma). #   You could also use a password consisting of only hexadecimal values, e.g. #   the websocket server and the webserver agree on the password. #   the value should be between 1 and 32 inclusive. #   The workers parameter indicates the maximum number of workshop members. #   This number must lie between 1 and 26. #   not the same as workshop http://www.exemplum.eu/55/workshop5.html. 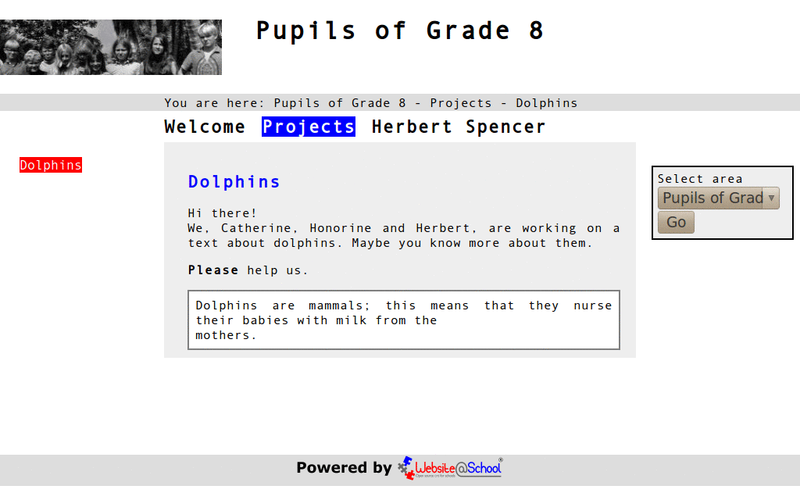 #   different installations of Website@School on the same server, e.g. #   installations share a single origin-entry and hence a single password. #   of workshops is 3 and the maximum number of workers is 7. #   of plain words for a total length of say 25 characters, e.g. #   The debug level must be a number between 0 and 7. #   log nothing. The recommend value is 6 (LOG_INFO). #   The default value for DEBUG is 6 (LOG_INFO). #   ip-address the IP-address to which the server will be listening. #   to all available interfaces. #   The default value for SERVER_ADDRESS is 0.0.0.0. #    or even a port under 1024 if it is running as root. #   The default value for SERVER_PORT is 8008. #   Default value is 1 (log to syslog). #   parameters are processed if possible. #   discarded when the configuration file is re-read at MARK-time. #  socket server using a captured token in a replay-attack. # The server periodically emits a MARK message. # websocket server will follow. Some hints on making an init script. For most of you known stuff. With your favorite text editor, copy and paste the script in the file. # This shell script takes care of starting and stopping CREW server. echo -n "Starting $PROG server: "
echo -n $"Stopping $PROG server: "
Move the file to /etc/rc.d/init.d/ or the place where the rc files reside on your system. Run chkconfig to create the appropriate symbolic links in the various /etc/rc*.d directories and set runlevels. Finally, check your work. Below examples, cut from /var/log/messages. 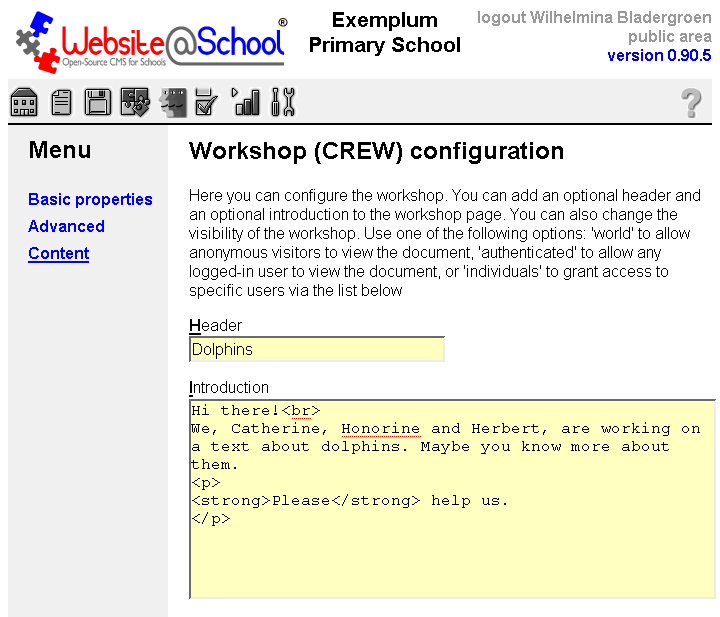 Jun 24 18:10:27 jh crewserver: forth in the License Agreement for Website@School (see license.html and about.html). successfull extern session with MacBook Pro with Firefox v. 21.0. The connection could not be established. Conclusion: the browser is guilty. A complaint from many Mac users. A user called/mailed. Here is our answer, maybe it serves you. The test can only be executed when you are absolutely sure that your side (server, firewall, ports) cannot be the problem. 1. You MUST use a recent Firefox browser version. You MUST have popup windowns enabled in Firefox. Look for 'Edit', Preferences and Content. mail us so we can send you details on how to do this. a. Look for the [Connect] button. browser screen) you see: CONNECTED. 'Rock it with HTML5 Websocket'. c. Click the [Send] button. d. Your text should appear in the Log. our logfiles and perhaps find something. Please tell us what you see in the browser. Omit the quotes ' '. Now press [Enter] on your keyboard. you can participate in the workshop. If 1, 2, 3, 4 and 5 succeed and 6 fails, probably the users router must be enabled to send traffic to the servers IP address with port forwarding in the router. Please report a bug at the address below.